The boutique hotel features “playful, beach house-chic vibes, offers an open-air lobby and vibrant pool deck,” on Ashford Ave., facing the Atlantic Ocean. The Serafina Beach Hotel, a 96-room oceanfront property in the heart of San Juan’s Condado tourist district, is set to open Nov. 15, according to published reports. Serafina Beach Hotel plans to target “millenials with money with a specific focus on girls’ and guys’ getaways,” Travel Agent Central reported. Rooms feature floor-to-ceiling windows overlooking the Atlantic Ocean or the adjacent Laguna del Condado, a nature sanctuary for protected marine wildlife. “Attentive staff help to plan adventures and experiences native to Puerto Rico, while guests enjoy luxurious amenities and stunning floor-to-ceiling views in the comfort of beautifully detailed rooms and suites,” according to the hotel’s website. Citing the hotel’s General Manager, Pierre-Alex Maillard, Travel Agent Central confirmed the property will feature a single suite — the Positano Ocean Terrace Suite — a 325 square-foot room with an additional 280 square feet of terrace space. The contemporary hotel will feature minimalist decor; modern design; an open-air atrium-style lobby with hanging chairs and full-size murals; three restaurants — including “aMare,” an Italian seafood eatery that can sit 120 people — and an infinity pool with nine poolside cabanas. 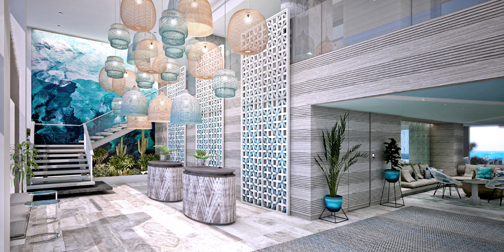 There will also be a lobby bar called Piña Co.
“Designed to be uniquely social, located in the epicenter of the buzzing Condado district of San Juan, the hotel leaves nothing to be desired by today’s traveler,” the hotel further stated on its site that confirms the November opening. Once operational, the property will be the first hotel venture for the Serafina Restaurant Group, which has 15 restaurant locations in the U.S., including one at La Concha hotel, also on Ashford Ave.
Nightly rates will start at $225 per room, double, in the low season and $345 in the high season, according to published reports. The article doesn’t report what was the previous name of the property. Hey Buddy!, I found this information for you: "Serafina Beach Hotel to open in Condado on Nov. 15". Here is the website link: https://newsismybusiness.com/serafina-beach-condado/. Thank you.